Mahogany is such a luxurious material for furniture that practically anything made from it is worth keeping in top-notch condition. Finishes rarely last as long as the wood they protect, but a dull finish isn't always one that needs to be replaced. It's good to know the difference between a finish that you can restore and one you need to strip; that knowledge might save you days of messy and painstaking work. 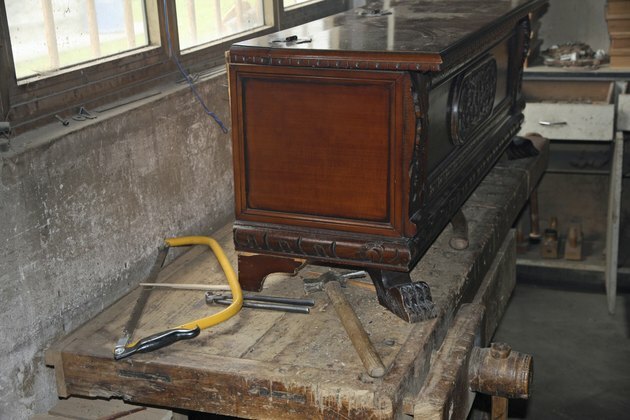 A mahogany chest on a work table in a workshop. A finish turns dull because of a buildup of dirt, which is often worsened by layers of old wax, or because the finish is full of microscopic cracks, which scatter light and prevent the finish from shining. You can restore the finish and correct both of these problems with a good cleaning and -- perhaps -- a new finish coat. You shouldn't try to save the finish, though, if the wood is stained or in need of repair. Nor should you try to save a sticky finish that may be the result of a chemical spill or simply deterioration. Finally, you should strip if large parts of the finish are missing -- you won't be able to blend the new finish properly. If you opt for restoration, you first need to test the existing finish so you can choose the proper cleaning solvents and finish materials. Dab an inconspicuous area with denatured alcohol and check for softening after a few minutes. If alcohol softens the finish, it's shellac. If the finish stays hard, try dabbing it with lacquer thinner; if lacquer thinner softens the finish, it's lacquer. It's possible that the finish will remain hard, and if neither softens the finish, it's polyurethane or varnish. The best cleaning procedure is a two-step method, using a solvent to remove oil-soluble dirt and soap and water to remove the rest. Naphtha is a suitable solvent in most cases, but test it on varnish to ensure it doesn't whiten the finish. Use distilled water and mild dish soap for the second part, mixing them in the ratio of 1 ounce of soap per gallon of water. The final step before you apply a new finish is to scuff the old finish. Sand by hand with 220-grit sandpaper, then progress to 320-grit, and finish with 400-grit. Wipe off the dust and brush or spray one touch-up coat of the same finish that's already on the piece of furniture. If you need to remove the old finish and apply a new one: Strip with a methylene chloride stripper and a paint scraper. If the finish is lacquer or shellac, and it's in poor shape, it may come off easily with a soy-based stripper, which is less caustic and easier to use. Neutralize the stripper by washing the wood with distilled water. Make any repairs, such as gluing broken joints and replacing lifting veneer. Fill nicks and gouges with stainable wood filler. Use filler that matches the color of the unstained mahogany. Sand out all the old stain with 120-grit paper and a palm sander; then hand-sand with 150-grit sandpaper. Stain the wood with liquid or gel stain, if desired. Seal the wood with wood sealer, oil finish or diluted lacquer, shellac or varnish; then scuff-sand with 220-grit sandpaper. Apply one or more finish coats, depending on the product you use. A single coat of penetrating oil followed by a coat of wax creates a luxurious finish for mahogany. If you use lacquer, shellac or varnish, you need at least two coats. Polish the finish with wax or polishing compound, as desired.